A black and white negative of one of Julian Beecroft's children. She is standing in front of the Beecroft residence known as the Grange. We believe the photograph to be of Norma Beecroft. 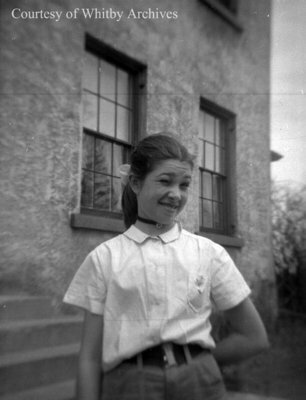 Beecroft Child, c.1945, Marjorie Ruddy. Whitby Archives A2013_040_637A.